For the town otherwise known as "The Brick City", see Newark, New Jersey. Brick Township is a township in Ocean County, New Jersey, United States. As of the 2010 United States Census, the township had a population of 75,072, making it the state's 13th-largest municipality and the third most populous municipality in Ocean County (behind Lakewood Township and Toms River Township), having seen a decline of 1,047 residents (-1.4%) from its population of 76,119 in the 2000 Census, when it was the state's 12th most-populous municipality. Map of Brick Township in Ocean County. Inset: Location of Ocean County highlighted in the State of New Jersey. While the majority of Brick Township is located on the mainland, Ocean Beaches I, II and III are situated on the Barnegat Peninsula, a long, narrow barrier peninsula that separates Barnegat Bay from the Atlantic Ocean. The mainland and beach area of the town are not geographically adjacent. Brick Township was incorporated as a township by an act of the New Jersey Legislature on February 15, 1850, from portions of both Dover Township (now Toms River Township) and Howell Township. The township was named after Joseph Brick, the owner of Bergen Iron Works located on the Metedeconk River. Portions of the township were taken to form Point Pleasant Beach (May 18, 1886), Bay Head (June 15, 1886), Lakewood Township (March 23, 1892), Mantoloking (April 10, 1911) and Point Pleasant (April 21, 1920). In 1963, voters rejected a referendum that would have changed the township's name to "Laurelton". The Havens Homestead Museum is dedicated to the Havens family that originally settled in the Laurelton/Burrsville section of Brick. The museum is the original Havens home which lies on a small plot of farmland. The museum has a gift shop and runs tours of the property daily. After hovering for years in the top five, in 2006, the township earned the title of "America's Safest City", out of 371 cities included nationwide in the 13th annual Morgan Quitno survey. Since the year 2000, Brick Township has been the safest "city" (population over 75,000) in New Jersey. In 2003 and 2004, Brick Township was ranked as the second safest city in the United States, after Newton, Massachusetts. In 2005, Brick Township had dropped down to the fifth safest "city" (population over 75,000) in the United States, before it rebounded to the top in 2006. In 2009, Brick Township ranked No. 6 on Newsmax magazine's list of the "Top 25 Most Uniquely American Cities and Towns," a piece written by current CBS News travel editor Peter Greenberg. In determining his ranking, Greenberg cited Brick's consistent nod as a safe city and that its "commercial development of big-box stores, department stores, and chain restaurants has made it a shopping destination for much of northern Ocean County." Brick Township has also been in the news for a claimed autism epidemic, in which 40 children out of over 6,000 surveyed were found to be autistic, though Brick's autism rate is statistically near the national average. Many of the children found to be autistic were born in Northern New Jersey and other parts of the country. There is no evidence that the levels of autism are linked to any specific environmental factor in Brick. Parents of children diagnosed with autism have moved to the township in order to make use of the special education programs offered by the school district. Brick has also been home to the heroin epidemic. According to the state's statistics, in 2012 Brick was ranked sixth in the state with 550 reported incidents of heroin or opiate abuse, behind Newark, Jersey City, Paterson, Atlantic City and Camden. In 2017, Brick improved to 438 reported heroin abuse cases, ranked ninth in the state. During the December 2010 North American blizzard, Brick Township received 30 inches (760 mm) of snow, the highest accumulation recorded in the state. In October 2012, parts of Brick were devastated by Hurricane Sandy. 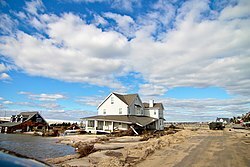 Barrier island and other waterfront properties were particularly hard hit. Homes and such buildings as the Shore Acres Yacht Club sustained major damage; some buildings had to be demolished. According to the United States Census Bureau, the township had a total area of 32.315 square miles (83.697 km2), including 25.715 square miles (66.602 km2) of land and 6.600 square miles (17.095 km2) of water (20.42%). Unincorporated communities, localities and place names located partially or completely within the township include Adamston, Arrowhead Village, Breton Woods, Burrsville, Cedar Bridge, Cedarwood Park, Cherry Quay, Greenbriar, Havens Cove, Havens Point, Herbertsville, Herring Island, Lanes Mills, Laurelton, Mandalay Park, Mardells Neck, Metedeconk, Metedeconk Neck, Osbornville, Playground Beach, Riviera Beach, Seaweed Point, Shore Acres, Sloop Point, Swan Point, West Mantoloking and West Osbornville. The communities of Herbertsville and Parkway Pines are located close to exit 91 of the Garden State Parkway, near the Monmouth County border, and are geographically distant from the rest of the township. Bayberry Court and Maypink Lane are two streets that are not accessible from any other Brick roads, and are served by the United States Postal Service as ZIP Code 07731 with Howell Township. The township borders Bay Head, Lakewood Township, Mantoloking, Point Pleasant and Toms River Township in Ocean County; and the Monmouth County municipalities of Brielle, Howell Township and Wall Township. 1981 - 2010 monthly climatic averages for Brick Beach, Ocean County, New Jersey. Avg Precip 3.7" 3.1" 4.2" 3.9" 3.5" 3.7" 4.6" 4.5" 3.5" 3.7" 3.9" 4.0" 46.3"
As of the 2010 United States Census, there were 75,072 people, 29,842 households, and 20,173.192 families residing in the township. The population density was 2,919.4 per square mile (1,127.2/km2). There were 33,677 housing units at an average density of 1,309.6 per square mile (505.6/km2). The racial makeup of the township was 93.05% (69,856) White, 2.00% (1,502) Black or African American, 0.14% (104) Native American, 1.56% (1,173) Asian, 0.04% (27) Pacific Islander, 1.80% (1,350) from other races, and 1.41% (1,060) from two or more races. Hispanic or Latino of any race were 7.06% (5,301) of the population. There were 29,842 households out of which 27.3% had children under the age of 18 living with them, 52.6% were married couples living together, 10.9% had a female householder with no husband present, and 32.4% were non-families. 27.2% of all households were made up of individuals, and 13.7% had someone living alone who was 65 years of age or older. The average household size was 2.49 and the average family size was 3.05. In the township, the population was spread out with 20.7% under the age of 18, 7.6% from 18 to 24, 23.8% from 25 to 44, 29.9% from 45 to 64, and 17.9% who were 65 years of age or older. The median age was 43.6 years. For every 100 females there were 91.0 males. For every 100 females ages 18 and older there were 87.6 males. The Census Bureau's 2006-2010 American Community Survey showed that (in 2010 inflation-adjusted dollars) median household income was $65,129 (with a margin of error of +/- $2,969) and the median family income was $81,868 (+/- $2,081). Males had a median income of $60,769 (+/- $1,755) versus $41,361 (+/- $1,655) for females. The per capita income for the township was $33,258 (+/- $891). About 4.1% of families and 5.2% of the population were below the poverty line, including 8.1% of those under age 18 and 5.9% of those age 65 or over. As of the 2000 United States Census there were 76,119 people, 29,511 households, and 20,775 families residing in the township. The population density was 2,901.5 people per square mile (1,120.5/km²). There were 32,689 housing units at an average density of 1,246.0 per square mile (481.2/km²). The racial makeup of the township was 95.81% White, 0.99% African American, 0.10% Native American, 1.19% Asian, 0.02% Pacific Islander, 0.85% from other races, and 1.04% from two or more races. Hispanic or Latino of any nationality were 3.85% of the population. There were 29,511 households out of which 31.6% had children under the age of 18 living with them, 56.8% were married couples living together, 10.2% had a female householder with no husband present, and 29.6% were non-families. 25.0% of all households were made up of individuals and 12.7% had someone living alone who was 65 years of age or older. The average household size was 2.56 and the average family size was 3.07. In the township the population was spread out with 23.8% under the age of 18, 6.4% from 18 to 24, 29.5% from 25 to 44, 23.3% from 45 to 64, and 17.0% who were 65 years of age or older. The median age was 39 years. For every 100 females, there were 90.5 males. For every 100 females age 18 and over, there were 86.8 males. The median income for a household in the township was $52,092, and the median income for a family was $61,446. Males had a median income of $44,981 versus $31,020 for females. The per capita income for the township was $24,462. About 3.1% of families and 4.5% of the population were below the poverty line, including 5.8% of those under age 18 and 5.0% of those age 65 or over. The Brick Pop Warner Little Scholars Mustangs finished the 2006 season with a perfect 9-0 record and won the Jersey Shore B Division. In 2003, and from 2006 to 2009, the Pop Warner Brick Mustang cheerleaders competed against other teams from across the nation in Disney World. In 2003, the junior peewee Mustang cheer squad won the national title. Brick is home of the Ocean Ice Palace, built in 1960, which hosts the Brick Hockey Club. The ice rink is also home to the Brick Stars, a special needs hockey team who has home games and practices. Brick Township Reservoir, with parts located in both Brick and Wall Township, covers 80 acres (32 ha) and is encircled by a 1.7-mile (2.7 km) trail. Fishing is permitted on the reservoir. The reservoir can hold up to 1,000,000,000 US gallons (3.8×109 l; 830,000,000 imp gal) of water, which is pumped in from the Metedeconk River. The township operates within the Faulkner Act (formally known as the Optional Municipal Charter Law) under the Mayor-Council plan 2 form of government, as implemented on January 1, 1990, based on direct petition. The governing body consists of a mayor and a seven-member Township Council whose members are elected to serve four-year terms of office, with either three or four seats up for election at-large on a staggered basis in odd-numbered years as part of the November general election. The mayor is elected for a four-year term without limitation as to the number of terms. In November 1988, the voters approved a referendum which returned the township to the partisan system of government, with township elections held as part of the November general election (rather than in May). The mayor is the township's chief executive and administrative officer and is responsible for administering local laws and policy development. The mayor makes various appointments, prepares the township's budget, and approves or vetoes ordinances adopted by the Township Council (which may be overridden by a ⅔ vote of the Township Council). The mayor appoints, with the advice and consent of the Township Council, the business administrator, the township attorney, and the directors of the Departments of Public Safety, Engineering and Public Works. As of 2018[update], the mayor of Brick Township is Democrat John G. Ducey, whose term of office ends on December 31, 2021. Members of the Township Council are Council President Paul Mummolo (D, 2017), Council Vice President Marianna Pontoriero (D, 2017), Lisa Crate (D, 2019), Heather deJong (D, 2017), James T. Fozman (D, 2019), Art Halloran (D, 2019) and Andrea Zapcic (D, 2019). In January 2014, the Township Council appointed Andrea Zapcic to fill the vacant council seat expiring in December 2015 of John G. Ducey after he took office as mayor. Zapcic won election in November 2014 to serve the balance of the term. Ducey was elected as mayor in 2013, garnering 62% of the vote to defeat Republican opponent Joseph Sangiovanni. Former Mayor Joseph C. Scarpelli resigned as of December 8, 2006, amid a federal corruption probe into township government. On January 8, 2007, Scarpelli pleaded guilty to federal bribery charges for accepting money from developers in exchange for using his official position to obtain approval for development projects. Township Clerk Virginia Lampman was appointed to fill the role of mayor until the Township Council could select a replacement. On December 17, 2007, former Scarpelli was sentenced in Federal Court in Newark to serve 18 months in prison and was fined $5,000, after admitting that he had accepted bribes from 1998 to 2003. On January 4, 2007, Daniel J. Kelly (D), the Township's Planning Board chairman, was appointed the new mayor by a three-member township council subcommittee. On November 6, 2007, Stephen C. Acropolis defeated Kelly in a race to fill the remaining two years of Scarpelli's term. Brick Township is located in the 3rd Congressional District and is part of New Jersey's 10th state legislative district. 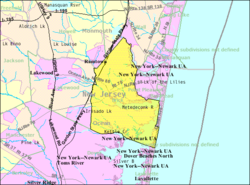 Prior to the 2010 Census, Brick Township had been part of the 4th Congressional District, a change made by the New Jersey Redistricting Commission that took effect in January 2013, based on the results of the November 2012 general elections. As of March 23, 2011, there were a total of 48,760 registered voters in Brick Township, of which 9,992 (20.5%) were registered as Democrats, 12,206 (25.0%) were registered as Republicans and 26,528 (54.4%) were registered as Unaffiliated. There were 34 voters registered to other parties. Among the township's 2010 Census population, 65.0% (vs. 63.2% in Ocean County) were registered to vote, including 81.9% of those ages 18 and over (vs. 82.6% countywide). In the 2012 presidential election, Republican Mitt Romney received 55.9% of the vote (18,484 cast), ahead of Democrat Barack Obama with 42.9% (14,184 votes), and other candidates with 1.2% (387 votes), among the 33,328 ballots cast by the township's 51,117 registered voters (273 ballots were spoiled), for a turnout of 65.2%. In the 2008 presidential election, Republican John McCain received 58.1% of the vote (21,912 cast), ahead of Democrat Barack Obama with 39.9% (15,031 votes) and other candidates with 1.3% (489 votes), among the 37,704 ballots cast by the township's 50,742 registered voters, for a turnout of 74.3%. In the 2004 presidential election, Republican George W. Bush received 60.9% of the vote (21,888 ballots cast), outpolling Democrat John Kerry with 37.8% (13,596 votes) and other candidates with 0.8% (363 votes), among the 35,954 ballots cast by the township's 48,235 registered voters, for a turnout percentage of 74.5. In the 2013 gubernatorial election, Republican Chris Christie received 74.4% of the vote (17,331 cast), ahead of Democrat Barbara Buono with 24.2% (5,633 votes), and other candidates with 1.4% (332 votes), among the 23,830 ballots cast by the township's 50,398 registered voters (534 ballots were spoiled), for a turnout of 47.3%. In the 2009 gubernatorial election, Republican Chris Christie received 67.3% of the vote (17,822 ballots cast), ahead of Democrat Jon Corzine with 25.2% (6,675 votes), Independent Chris Daggett with 5.0% (1,336 votes) and other candidates with 1.0% (272 votes), among the 26,479 ballots cast by the township's 49,529 registered voters, yielding a 53.5% turnout. The Brick Public Schools serve students in pre-kindergarten through twelfth grade. As of the 2011-12 school year, the district's 12 schools had an enrollment of 9,893 students and 729.1 classroom teachers (on an FTE basis), for a student–teacher ratio of 13.57:1. Schools in the district (with 2011-12 enrollment data from the National Center for Education Statistics) are Primary Learning Center (had 672 students in pre-Kindergarten and Kindergarten; reconfigured as Warren H. Wolf Elementary School), Drum Point Elementary School (458; K-5), Herbertsville Elementary School (249; K-5), Lanes Mill Elementary School (505; K-5), Midstreams Elementary School (513; K-5), Osborneville Elementary School (299; K-5), Veterans Memorial Elementary School (619; K-5), Warren H. Wolf Elementary School (NA, created for 2014-15 school year from Primary Learning Center) Emma Havens Young Elementary School (865; K-5), Lake Riviera Middle School (1,063; 6-8), Veterans Memorial Middle School (1,243; 6-8), Brick Memorial High School (1,842; 9-12) and Brick Township High School (1,573; 9-12). Nonsectarian private schools include Cuddle Care Early Childhood Center and Ocean Early Childhood Center. St. Dominic Elementary School is a Roman Catholic private school overseen by the Roman Catholic Diocese of Trenton, and St. Paul's Christian School, a Methodist private school, serve students in nursery through eighth grade. As of May 2010[update], the township had a total of 318.77 miles (513.01 km) of roadways, of which 256.23 miles (412.36 km) were maintained by the municipality, 46.64 miles (75.06 km) by Ocean County and 12.61 miles (20.29 km) by the New Jersey Department of Transportation and 3.29 miles (5.29 km) by the New Jersey Turnpike Authority. The Garden State Parkway is the most prominent highway passing through Brick. It traverses the western part of the municipality with three interchanges: Exits 91, 90, and 89. Three state routes also pass through: Route 70 Route 88, and Route 35. The major county routes that pass through are CR 528, and CR 549 (as well as its spur). The Laurelton Circle was located near the center of Brick Township. The traffic circle was at the junction of Route 70, Route 88 and Princeton Avenue. It was converted to a traffic light regulated intersection in 1986, due to an increase in traffic and accidents. To reduce the need for left turns, a short portion of eastbound Route 88 was re-routed onto Princeton Avenue. Some other movements are controlled by jughandles and a two-way connection in the northwest corner. NJ Transit offers bus service between the township and the Port Authority Bus Terminal in Midtown Manhattan on the 137 route, to Philadelphia on the 317 and to Newark on the 67. Ocean Ride service is provided on route 3, 3A and 4. WBGD 91.9FM (Brick Green Dragons) went on the air in 1974, originally located at Brick Township High School. The station was later moved to Brick Memorial High School. The radio station was the brainchild of a teacher named Robert Boesch who taught electronics at Brick Township High School in the 1960s, 1970s and 1980s. The station was a student-run operation and received its FCC license from the FCC for Educational Broadcasting. One of the most notable broadcasts was the first ever state high school football championship game played between Brick Township High School and Camden High School in December 1974. The Brick Green Dragons defeated Camden by a score of 21-20 on the last play of the game to win the title. In 2007, during routine roof maintenance and repair work, the broadcast tower was cut off the roof, and was never replaced or repaired. In 2010 WBGD's license was retired. The Asbury Park Press provides daily news coverage of the township, as does WOBM-FM radio. The government of the township provides material and commentary to The Brick Times, which is one of seven weekly papers from Micromedia Publications. See also: Category:People from Brick Township, New Jersey. Joe Acanfora (born 1950, class of 1968), educator and activist who fought to teach earth science in public schools in the early 1970s but was dismissed based upon his acknowledged homosexuality. Robert Auriemma, the winningest high school ice hockey coach in state history, he was ranked fourth nationally for wins among high school ice hockey coaches, achieving his 600th on January 8, 2008. Harry Bernstein (1910–2011), author of The Invisible Wall. Hank Borowy (1916–2004), Major League Baseball All-Star pitcher who played for the New York Yankees, Chicago Cubs, Philadelphia Phillies, Pittsburgh Pirates and Detroit Tigers. He lived the majority of his life in Brick Township and died there at age 88. Nick Catone (born 1981), mixed martial artist who participates in the Ultimate Fighting Championships. Jim Dowd, (born 1968), former player in the National Hockey League (NHL), won a Stanley Cup with the 1994-95 New Jersey Devils and last played for the Philadelphia Flyers. John Paul Doyle (born 1942), politician who served as majority leader of the New Jersey General Assembly. Kirsten Dunst (born 1982), actress, grew up in the township before relocating to California. Garrett Graham (born 1986), NFL tight end who plays for the Houston Texans. John Laursen (born 1988), United States Army Iraq / Afghanistan Veteran and ice hockey player for the USA Warriors. Jack Martin (1887–1980), Major League Baseball infielder who played for the 1912 New York Yankees (Highlanders), 1914 Philadelphia Phillies and Boston Braves, who lived out his twilight years in Brick Township and is the namesake of Jack Martin Boulevard. Tom McCarthy (born 1968), television announcer for the Philadelphia Phillies. Melanie McGuire (born 1972), murderess convicted of killing and dismembering her husband. Daniel F. Newman (1935–2009), politician who served in the New Jersey General Assembly and as Mayor of Brick Township. John Sadak (born 1979, class of 1996), radio/TV sports announcer with Westwood One radio, CBS Sports Network, the ESPN family of networks, Fox Sports 1 and the Triple-A affiliate of the New York Yankees, the Scranton/Wilkes-Barre RailRiders. Travis Spader, ATV motocross racer, lived in Brick when he won his GNC National Championship in 2000. Art Thoms, (born 1947), NFL defensive tackle for the Oakland Raiders (1969–1975) and Philadelphia Eagles (1977). Scott Thomsen (born 1993), soccer player who plays as a defender for the Richmond Kickers in the United Soccer League. Warren Wolf, long-time football coach for Brick Township High School who served on the Brick council as freeholder and in the state assembly. ^ a b c Mayor's Office Archived 2017-07-28 at the Wayback Machine, Township of Brick. Accessed July 26, 2016. ^ Business Administrator, Township of Brick. Accessed March 18, 2018. ^ Township Clerk and Vital Statistics, Township of Brick. Accessed March 18, 2018. ^ U.S. Geological Survey Geographic Names Information System: Township of Brick, Geographic Names Information System. Accessed March 4, 2013. ^ a b c d e f DP-1 - Profile of General Population and Housing Characteristics: 2010 for Brick township, Ocean County, New Jersey, United States Census Bureau. Accessed January 22, 2012. ^ a b The Counties and Most Populous Cities and Townships in 2010 in New Jersey: 2000 and 2010 Archived 2011-02-21 at the Wayback Machine, United States Census Bureau. Accessed March 15, 2012. ^ a b c Table DP-1. Profile of General Demographic Characteristics: 2010 for Brick township, Ocean County, New Jersey Archived 2014-08-10 at the Wayback Machine, New Jersey Department of Labor and Workforce Development. Accessed January 22, 2012. ^ a b PEPANNRES - Annual Estimates of the Resident Population: April 1, 2010 to July 1, 2017 - 2017 Population Estimates for New Jersey municipalities, United States Census Bureau. Accessed January 25, 2019. ^ Look Up a ZIP Code for Brick, NJ, United States Postal Service. Accessed January 22, 2012. ^ ZIP Codes, State of New Jersey. Accessed September 18, 2013. ^ Area Code Lookup - NPA NXX for Brick, NJ, Area-Codes.com. Accessed September 18, 2013. ^ Geographic Codes Lookup for New Jersey, Missouri Census Data Center. Accessed December 26, 2012. ^ Cullinane, Bob. "Brick Beaches", Asbury Park Press, July 28, 2002. Accessed January 22, 2012. ""There are three public access beaches in Brick (Ocean Beach I, Ocean Beach II, Ocean Beach III) that, in total, cover about a half-mile. These should not be confused with Ocean Beach, a section of Dover Township, just south of Brick's Ocean Beaches. Got it?" ^ Donatiello, Gene. "Who is Joseph Woolston Brick? ", Brick Township Historical Society. Accessed February 19, 2013. "The new township was named after its most prominent citizen Joseph Woolston Brick. Joseph W. Brick was the industrious and successful owner of Bergen Iron Works." ^ a b Snyder, John P. The Story of New Jersey's Civil Boundaries: 1606-1968, Bureau of Geology and Topography; Trenton, New Jersey; 1969. p. 201. Accessed January 22, 2012. ^ Wright, George Cable. "JERSEY AROUSED BY REFERENDUMS; Some Ballots on Tuesday to List Nine Questions", The New York Times, November 3, 1963. Accessed July 5, 2012. "Brick Township will become Laurelton, as it was known in 1904, if a local referendum is adopted. The change to Brick was made just before the Civil War when bricklayers formed an influential segment of the local population." ^ Henry Harry "Clay" Havens, Brick Township Historical Society. Accessed January 22, 2013. ^ 13th Annual Safest (and Most Dangerous) Cities: Top and Bottom 25 Cities Overall Archived 2011-06-15 at the Wayback Machine, accessed October 30, 2006. ^ 11th Annual Safest (and Most Dangerous) Cities: Top and Bottom 25 Cities Overall Archived December 25, 2011, at the Wayback Machine, accessed June 4, 2006. ^ 12th Annual Safest (and Most Dangerous) Cities: Top and Bottom 25 Cities Overall Archived 2011-07-14 at the Wayback Machine, accessed June 4, 2006. ^ Greenberg, Peter. "Newsmax Magazine Rates the Top 25 Most Uniquely American Cities And Towns 6. Brick Township, N.J.", Newsmax. Accessed March 24, 2016. ^ Bertrand, et al. "Prevalence of Autism in a United States Population: The Brick Township, New Jersey, Investigation". Pediatrics Journal of the American Academy of Pediatrics, November 5, 2001. Accessed January 20, 2013. "Conclusions: The prevalence of autism in Brick Township seems to be higher than that in other studies, particularly studies conducted in the United States, but within the range of a few recent studies in smaller populations that used more thorough case-finding methods." ^ Nee, Daniel. "As Federal Report on Autism is Released, Brick School Officials Wish Funding Promises Were Kept" Archived 2011-12-10 at the Wayback Machine, January 24, 2011. Accessed January 20, 2013. "Still, Hrycenko and Magovern agreed that the noted program in Brick is necessary, despite a lack of assistance from outside sources. 'There's no doubt about it,' said Magovern. 'Especially in the autistic population, a lot of people move here because we provide those services in the district.'" ^ Davis, Tom. "30 NJ Towns With The Most Heroin Abuse In New 2018 Report", Point Pleasant Patch, October 1, 2018. Accessed January 3, 2019. ^ Nierenberg, Larry. "Winter Storms", Storm Spotter's Newsletter, National Weather Service, Mount Holly, New Jersey, Volume 3, Issue 4, Spring 2011, pp. 2-3. Accessed February 19, 2013. "A strong Nor'easter system impacted the Middle Atlantic region starting early Sunday morning December 26th and ending on Monday December 27th.... Numerous locations along the New Jersey coast received 20 inch or higher amounts, with the greatest snowfall measurement of 30 inches taken in Brick Township in New Jersey." ^ O'Reilly, David; Katz, Matt; and Simon, Darran. "Not a blizzard, but snowfall was one for the books", The Philadelphia Inquirer, December 28, 2010. Accessed February 6, 2013. "Coming in from the south on winds that gusted as high as 62 m.p.h. at Wilmington's airport, the storm left accumulations of just two to six inches to the north of the city, but dropped 26 inches on parts of Cape May County, piled 30 inches on Brick Township, Ocean County, and paralyzed New York City and much of New England." ^ Areas touching Brick Township, MapIt. Accessed August 9, 2015. ^ Barnett, Bob. Population Data for Ocean County Municipalities, 1850 - 2000, WestJersey.org, January 6, 2011. Accessed December 25, 2012. ^ Compendium of censuses 1726-1905: together with the tabulated returns of 1905, New Jersey Department of State, 1906. Accessed September 18, 2013. ^ Raum, John O. The History of New Jersey: From Its Earliest Settlement to the Present Time, Volume 1, p. 280, J. E. Potter and company, 1877. Accessed December 25, 2012. ""Brick township contained in 1850, 1,558 inhabitants; in 1860, 1,385; and in 1870, 2,724." Note that 1860 population of 1,385 conflicts with Ocean County census data, which shows 1,835 for that year. ^ Debow, James Dunwoody Brownson. The Seventh Census of the United States: 1850, p. 140. R. Armstrong, 1853. Accessed December 25, 2012. ^ Staff. A compendium of the ninth census, 1870, p. 260. United States Census Bureau, 1872. Accessed December 25, 2012. ^ Porter, Robert Percival. Preliminary Results as Contained in the Eleventh Census Bulletins: Volume III - 51 to 75, p. 99. United States Census Bureau, 1890. Accessed December 25, 2012. ^ Thirteenth Census of the United States, 1910: Population by Counties and Minor Civil Divisions, 1910, 1900, 1890, United States Census Bureau, p. 338. Accessed December 25, 2012. ^ Fifteenth Census of the United States : 1930 - Population Volume I, United States Census Bureau, p. 718. Accessed December 25, 2012. ^ a b c d e Census 2000 Profiles of Demographic / Social / Economic / Housing Characteristics for Brick township, Ocean County, New Jersey[permanent dead link], United States Census Bureau. Accessed January 22, 2012. ^ a b c d e DP-1: Profile of General Demographic Characteristics: 2000 - Census 2000 Summary File 1 (SF 1) 100-Percent Data for Brick township, Ocean County, New Jersey, United States Census Bureau. Accessed December 25, 2012. ^ DP03: Selected Economic Characteristics from the 2006-2010 American Community Survey 5-Year Estimates for Brick township, Ocean County, New Jersey, United States Census Bureau. Accessed January 22, 2012. ^ Brick Dragon Pee Wee team wins division title, Brick Township Bulletin, October 26, 2006. ^ Erickson, Stephanie. "Gooooooo, Clermont! Cheer Team Earns Kudos", Orlando Sentinel, December 12, 2003. Accessed January 22, 2012. "The Cheer & Dance Championships consist of 160 small and large squads competing in four age classifications. Taking first place in the junior peewee small division were the Brick Memorial Mustangs from Brick, N.J."
^ Miller, Patricia A. "Township to buy Ocean Ice Palace for $5M; Building, 13.3-acre site to be used as new community center" Archived 2014-07-19 at the Wayback Machine, Brick Township Bulletin, July 26, 2007. Accessed September 18, 2013. ^ Brick Stars, American Special Hockey Association. Accessed June 26, 2015. ^ Reservoir Information, Brick Township Municipal Utilities Authority. Accessed November 16, 2016. ^ "The Faulkner Act: New Jersey's Optional Municipal Charter Law" Archived October 12, 2013, at the Wayback Machine, New Jersey State League of Municipalities, July 2007. Accessed September 17, 2013. ^ Saverino v. Zboyan, Leagle, Superior Court of New Jersey, Appellate Division. Decided March 13, 1990. Accessed June 26, 2015. "During 1987-1988, a movement was initiated in the township seeking a modification of the charter to provide for partisan elections, rather than non-partisan, to be conducted in November, rather than May. A petition of approximately 2,697 voters was presented to the governing body, which adopted an ordinance presenting the proposed modification to the voters under the initiative and referendum section of the act, N.J.S.A. 40:69A-184.... In the November 1988 referendum, the voters adopted the modification." ^ Township Council Archived 2017-07-28 at the Wayback Machine, Brick Township. Accessed July 26, 2016. ^ 2016 Municipal User Friendly Budget Archived 2016-12-24 at the Wayback Machine, Brick Township. Accessed July 26, 2016. 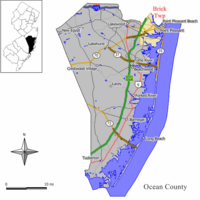 ^ Township of Brick, Ocean County, New Jersey. Accessed July 26, 2016. ^ a b General Election November 5, 2013, Ocean County, New Jersey Clerk, updated November 14, 2013. Accessed July 26, 2016. ^ Huba, Nicholas. "Andrea Zapcic is new Brick council memberFormer head of local recreation department takes mayor's old spot", Asbury Park Press, January 30, 2014. Accessed August 9, 2015. "Andrea Zapcic, 56, was sworn in Tuesday night as a councilwoman. Ducey, a Democrat, resigned from his council seat after being sworn in as mayor." ^ Galioto, Catherine. "Former Brick Rec Director Sworn In to Fill Ducey's Council Seat", Brick Patch, January 29, 2014. Accessed August 9, 2015. "Andrea Zapcic is Brick Township's newest council member, picked to fill the seat vacated by Mayor John G. Ducey.... Zapcic was the choice picked by the local Democratic committee, after the vacancy created by Ducey's election to mayor." ^ Restoring trust in government challenge for Brick officials, Asbury Park Press, January 10, 2007. ^ Brick mayor resigns; township clerk to become new mayor, Asbury Park Press, December 6, 2006. ^ "New Jersey: Brick Township: Mayor Resigns", The New York Times, December 8, 2006. ^ Rundquist, Jeanette. "Former Brick mayor sentenced to 18 months", The Star-Ledger, December 17, 2007. Accessed January 22, 2012. "Former Brick Township Mayor Joseph Scarpelli was sentenced to 18 months in federal prison today, and fined $5,000, for taking bribes in exchange for helping a developer gain approval for construction projects. Scarpelli, 68, who in January admitted taking more than $5,000 in bribes, was sentenced in District Court in Newark in front of about a dozen family and friends, including four grown children." ^ Kelly is appointed as mayor in Brick, The Asbury Park Press, January 5, 2007. ^ Schweiger, Tristan J. "Acropolis leads sweep, hails start of a new era", Asbury Park Press, November 7, 2007. Accessed January 22, 2012. ^ a b Voter Registration Summary - Ocean, New Jersey Department of State Division of Elections, March 23, 2011. Accessed December 25, 2012. ^ GCT-P7: Selected Age Groups: 2010 - State -- County Subdivision; 2010 Census Summary File 1 for New Jersey, United States Census Bureau. Accessed December 25, 2012. ^ 2008 Presidential General Election Results: Ocean County, New Jersey Department of State Division of Elections, December 23, 2008. Accessed December 25, 2012. ^ 2004 Presidential Election: Ocean County, New Jersey Department of State Division of Elections, December 13, 2004. Accessed December 25, 2012. ^ 2009 Governor: Ocean County, New Jersey Department of State Division of Elections, December 31, 2009. Accessed December 25, 2012. ^ District information for Brick Township School District, National Center for Education Statistics. Accessed August 14, 2014. ^ School Data for the Brick Public Schools, National Center for Education Statistics. Accessed August 14, 2014. ^ Drum Point Elementary School, Brick Township Schools. Accessed August 14, 2014. ^ Herbertsville Elementary School, Brick Township Schools. Accessed August 14, 2014. ^ Lanes Mill Elementary School, Brick Township Schools. Accessed August 14, 2014. ^ Midstreams Elementary School, Brick Township Schools. Accessed August 14, 2014. ^ Osborneville Elementary School, Brick Township Schools. Accessed August 14, 2014. ^ Veterans Memorial Elementary School, Brick Township Schools. Accessed August 14, 2014. ^ Warren H. Wolf Elementary School Archived 2014-11-06 at the Wayback Machine, Brick Township Schools. Accessed August 14, 2014. ^ Huba, Nicholas. "Is there a new school planned for Brick? ", Asbury Park Press, June 21, 2014. Accessed August 14, 2014. "In response, school district officials are transforming the Primary Learning Center from a prekindergarten-kindergarten facility into a kindergarten through fifth-grade elementary school, Superintendent Walter Uszenski said.The new school will be renamed Warren H. Wolf Elementary School in honor the former Brick Township High School football coach." ^ Emma Havens Young Elementary School, Brick Township Schools. Accessed August 14, 2014. ^ Lake Riviera Middle School, Brick Township Schools. Accessed August 14, 2014. ^ Veterans Memorial Middle School, Brick Township Schools. Accessed August 14, 2014. ^ Brick Memorial High School, Brick Township Schools. Accessed August 14, 2014. ^ Brick Township High School, Brick Township Schools. Accessed August 14, 2014. ^ New Jersey School Directory for Brick Public Schools, New Jersey Department of Education. Accessed December 29, 2016. ^ About Us Archived 2013-12-08 at the Wayback Machine, Saint Paul's Christian School. Accessed September 18, 2013. ^ Moore, Kirk. "History of Traffic Circles", Asbury Park Press, August 24, 2006. Accessed March 15, 2012. ^ Ocean County Bus / Rail Connections, NJ Transit, backed up by the Internet Archive as of February 20, 2012. Accessed January 22, 2012. ^ Ocean Ride Rider's Guide, Ocean County, New Jersey. Accessed August 9, 2015. ^ The Brick Times Archived 2016-08-03 at the Wayback Machine, Micromedia Publications. Accessed July 26, 2016. "First published in 2002. Serving Brick and Lakewood Townships in Ocean County, New Jersey"
^ Simpson, Craig. "MoCo Gay Teacher Fired 1972; Justice Denied for 40 Years", Washington Area Spark, December 20, 2012. Accessed November 20, 2017. "Acanfora hadn't started at the University as an activist. He had graduated from Brick Township High School in New Jersey as class valedictorian in 1968 and entered Penn State in the fall on a Navy ROTC scholarship." ^ Scrimenti, Amanda. "Some things never change: Robert Auriemma a steady presence at BTHS", Asbury Park Press, January 25, 2005. Accessed August 4, 2008. ^ Rich, Motoko. "Successful at 96, Writer Has More to Say", The New York Times, April 7, 2007. Accessed March 15, 2012. "Harry Bernstein at his home in Brick, NJ." ^ Goldstein, Richard. "Hank Borowy, 88, Top Pitcher With Yankees and Cubs in 40's", The New York Times, August 26, 2004. Accessed January 22, 2012. "Hank Borowy, a right-handed pitcher who helped the Yankees capture pennants in 1942 and 1943, then starred for the last Chicago Cubs team to reach the World Series, died Monday at his home in Brick, N.J. He was 88.... Borowy, a native of Bloomfield, N.J., who pitched for Fordham University, was 15-4 as a rookie on the Yankees' 1942 pennant winners." ^ Del Mastro, Rob. "Brick's Nick Catone a profile in courage", Asbury Park Press, May 19, 2004. Accessed January 6, 2011. ^ Chere, Rich. "Former New Jersey Devils center Jim Dowd cut by Flyers", The Star-Ledger, October 4, 2008. Accessed November 11, 2008. "Jim Dowd, the Brick native who attended the Philadelphia Flyers' training camp on a tryout contract, was cut by the team Saturday morning." ^ Sullivan, Joseph F. "Focus Is on a Few Close Races for New Jersey Legislature", The New York Times, November 1, 1991. Accessed March 24, 2016. "His longtime running mate in the 10th District in Ocean County, Assemblyman John Paul Doyle of Brick Township, has moved up to run for the Senate and is in tight race with Andrew R. Ciesla, a Councilman in Brick, who is running hard on the generic Republican campaign of opposition to the Florio tax package as well as Mr. Doyle's votes for the taxes." ^ A waterfront haven named for iron works owner Archived 2006-01-04 at Archive.today, Asbury Park Press, September 8, 2005. ^ Garrett Graham, Houston Texans. Accessed January 6, 2011. ^ "Wounded warrior finds solace, brotherhood on the ice". www.army.mil. Retrieved 2017-03-31. ^ Staff. "JACK MARTIN DEAD; OLDEST EX-YANKEE; Jerseyan, 93, Played at Shortstop for the Highlanders In 1912", The New York Times, July 6, 1980. Accessed December 2, 2008. ^ Tom McCarthy Archived 2007-09-27 at the Wayback Machine, WFAN. Accessed August 26, 2007. "A 1986 graduate of Brick Memorial High School and a 1990 graduate of TCNJ, Tom and his wife Meg have four children: Patrick (10), Tommy (8), Maggie (5) and Kerri (3), and live in Allentown, NJ." ^ Din, Suleman E. (2007-07-19). "McGuire sentenced to life in prison for suitcase murder". Star-Ledger Updates. Retrieved 2011-06-15. ^ Paolantonio, S.A. "Environmental Debate Engrosses Shore Voters", The Philadelphia Inquirer, September 26, 1989. Accessed March 24, 2016. "Daniel F. Newman, the mayor of Brick Township, pulls out a poster-sized aerial photograph of Toms River where it feeds Barnegat Bay, Ocean County's pristine inlet waterway stretching 45 miles along the Jersey shore." ^ Adelizzi, Joe. "'Voice' of Rowan gets word out", Asbury Park Press, February 8, 2003. Accessed November 6, 2017. "John Sadak of Brick, who has won numerous awards during his tenure at Rowan University, is hoping to make broadcasting his career.... Sadak, who graduated from Brick Memorial High School in 1996, describes himself as a lifelong fan." ^ Arritt, Dan. "Part-Timer Completes His Sweep of Series; Motor racing: Tustin's Dubach wins third in a row in Thunder Bikers at U.S. Off-Road Championship event in Anaheim. ", Los Angeles Times, January 30, 2000. ^ Art Thoms player profile Archived 2007-02-09 at the Wayback Machine, database Football. Accessed August 11, 2007. ^ Art Thoms Archived 2007-09-30 at the Wayback Machine, Oakland Raiders. Accessed August 11, 2007. "I started playing football in high school. It was the freshman team at Wayne High School in Wayne, N.J. I played two years there and then my family moved to Brickjohn [sic], NJ. I played the last two years of high school ball there." ^ Scott Thomsen, Major League Soccer. Accessed July 26, 2016. "Raised in Brick, New Jersey, and attended Christian Brothers Academy in Lincroft, New Jersey, where he led CBA to unbeaten 21-0 season in 2011, scoring the game-winning goal in the Non-Public Group A state championship game while playing through injury and earning Central Jersey Player of the Year honors"
^ Wall, Karen E. "The gray ghost wishes he could be invisible" Archived 2005-12-25 at Archive.today, Asbury Park Press, November 18, 1999. "He also served as mayor of Brick from 1971-75, was an Ocean County freeholder from 1975-81, a state Assemblyman from 1981-83, and served on the Brick Township Council from 1982 until his defeat in the mayoral race in 1993." Wikimedia Commons has media related to Brick Township, New Jersey.